There is little debate, when it comes to multiplayer party games on the Super Nintendo 'Super Bomberman' reigns supreme. At the time Total! Magazine called it "the best multiplayer game ever devised" and Nintendo Magazine System magazine was equally enamoured saying "in four player mode put quite simply Bomberman is the most addictive game ever ". It can be enjoyed by four people simultaneously and all the core mechanics can be learnt by a new player in 10 seconds, without a word of instruction said. 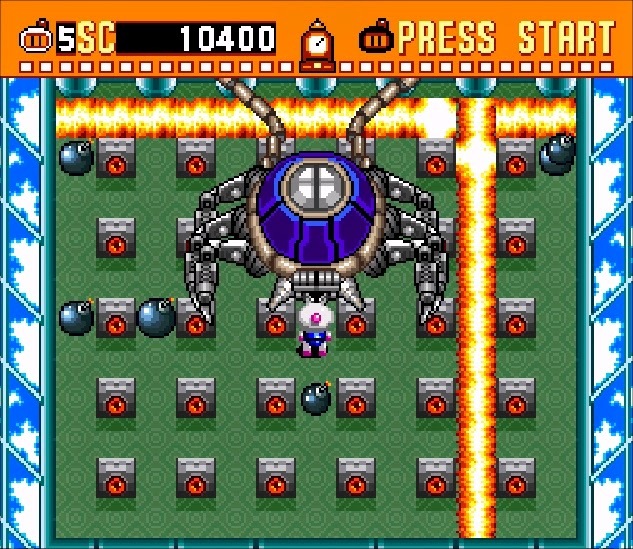 In battles mode all players guide their differently coloured Bomberman around a grid like single screen level. The main objective is a simple one; kill all the other players and be the last Bomberman standing. 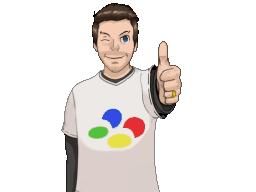 On their first try, the first thing anyone new to 'Bomberman' will do is press an action button which will of course make their colourful avatar drop a bomb. In a blind panic they will then press a direction button and in so doing get trapped between a wall and this ticking time bomb. The seconds pass and the bomb explodes; killing the player who has dropped it and destroying some walls but not others. They are out of that specific round of course but all is not lost, in this tragic display of suicidal haste they have leant all the main mechanics of the game. Within ten seconds of starting their first ever game this new player will now know that bombermen drop bombs, these bombs destroy fragile walls but not solid ones and these bombs also kill themselves. By logical extension they will also kill other bombermen and consequently they now know enough to enjoy the game. In their next round they will then somehow instinctively know to drop a bomb in a place that can be escaped from and from that point on they can successfully compete in the battle with other players. Of course with each round they will better understand the nuisances of these basic ideas and come up with the best tactics to use them. They will then learn through experimentation that bonuses alter these mechanics in various ways, but all of these are easily understood because the primary idea of the game is so fantastically simple: drop a bomb, hide around the corner from it and watch as it blows things up. It's because anyone can teach themselves how to play Bomberman within seconds that it is so perfectly suited to party play. Consequently, if you and your friends have a penchant for destruction, 16 bit games and you have a multiplayer adapter with four controllers you owe it to yourself to get this game. With many people gathered around a Snes the fun offered by 'Super Bomberman' or one of its sequels is hard to top. But what if you don't have lots of friends eager to play? Everyone knows that a 'Bomberman' game is terrific fun with many people but what if you're alone, is there actually an enjoyable experience to be had? It's hard to imagine now the game is so well known for it's multiplayer battle mode but the original game was one player only. The earliest entry in the series was released in 1983 for Japanese home computers. Though it was released in Europe as 'Eric and the Floaters' on the ZX Spectrum, it didn't find any sort of success until it was ported to the NES by Shinichi Nakamoto in a marathon 72 hour programming session. 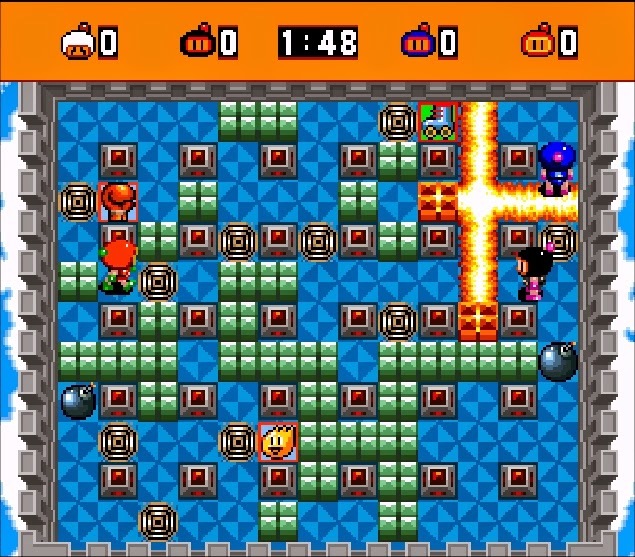 In this game, rather than using bombs to blow up other players the goal for the Bomberman is to place bombs to destroy the level's enemies. The player must also find the goal that is hidden under one of the soft blocks. The complication being that this goal is only activated once all enemies are destroyed. These general rules for the single player game are faithfully replicated in 'Super Bomberman' and across the game's 36 stages the play is essentially the same as in the NES original. 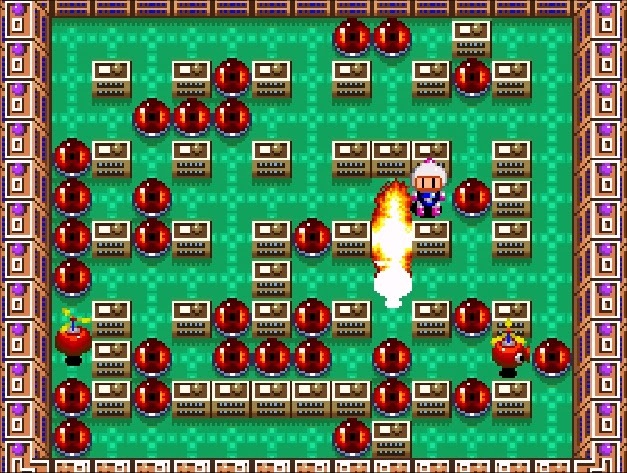 The enemies in these three dozen stages vary, with some following a set path through the brick mazes, some being able to with stand several hits and others stalking Bomberman. However, regardless of their attack pattern the method of killing these enemies is the same, and it's fortunately something that comes rather naturally to Bomberman. Unlike the earlier NES entry in the series (and later Snes iterations) the levels in 'Super Bomberman' are limited to one screen. Sadly, without the variation that scrolling would allow, the stages do quickly feel repetitive, with difficulty being defined by the number of enemies and their speed rather than complexity of the environments themselves. 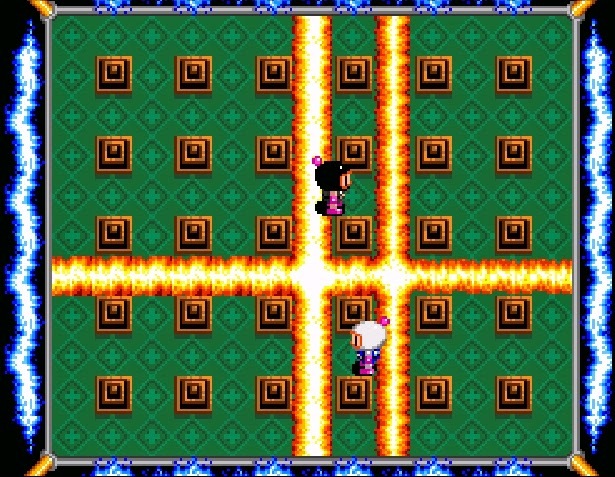 At least since stages are divided up into six worlds of eight stages each as at the end of a world Bomberman does have to face against a boss. These typically are screen filling foes that require inventive thinking to defeat. On a play through its likely the bulk of your lives will be taken initially trying to figure out the technique needed to exploit the bosses' weakness. Not that lives are a problem of course, with infinite continues meaning that any challenge is quickly diluted. It's slightly odd that the different stages of the battle mode see different gimmicks, such as search lights and conveyor belts. These however do not feature in the single player stages, when the tweets to gameplay would have made the different worlds stand apart more. As it is, although they each look different, bosses aside, what you do in each works is identical across the whole game. That's not to say the game looks samey of course, as visually each world looks unique. Combined and with an adorable anime styled central character 'Super Bomberman' does look nice, simple and functional but still attractive. Likewise the music across the game sounds varied yet cohesive. The soundtrack of the single player game offers six different variations of Jun Chikuma's original Nes stage music. It's a nice nod to the series' roots yet a way of remaining current; a trick that was pulled by every 'Bomberman' game that followed. 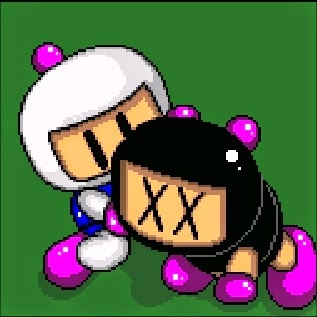 It's doubtful that anyone opting to play 'Super Bomberman' is in the pursuit of a engaging story, but even so it's a shame that the short introductory cut scene has been excised from any release outside of Japan, despite having no dialogue to be translated or objectionable content. Odder still the images from (スーパーボンバーマン, Sūpā Bonbāman) still exist on the international cartridge and can be even be accessed (using Pro Action Replay code 7E00A433). It's not something that significantly damages the game, it's just seems an odd development choice considering the content exists. It would have at the very minimum marginally expanded on the single player game length, as passwords and infinite continues means the game can be finished in less than nineties minutes. In some ways it feels like a modern FPS, where the main attraction is the multiplayer and the single player is an afterthought. Indeed, even on your own more fun can be had selecting the battle mode over the single player mode and competing against 3 AI opponents. On the hardest setting the computer offers a pretty ruthless opponent and the result is more challenging than the majority of the solo game. At the very least it will offer a chance to practice for the opportunity when you can play the game with friends as having played it quite extensively I believe that the one player mode is not a reason to buy 'Super Bomberman'. The game is and probably always has been a multiplayer title, and fortunately that's worth the price if admission alone. 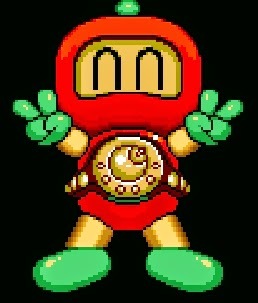 I've always had a blast playing games from the 'Bomberman' series. Birthday parties at my house involved regular bouts of 5 player 'Dyna Blaster' on my brother's Amiga and when friends came over we would always dabble in two player 'Super Bomberman'. It wasn't limited to my youth though, as part of my stag do involved my friends and I playing the Wii version before going out and celebrating my upcoming wedding in the more traditional, less geeky way. It was a game I played quite a lot with my wife when we were younger, and when I started rebuilding my Super Nintendo collection it was a title she wanted to get me. I received it for my 32nd birthday and hopefully it'll be something I play with my children as they get older and become Bombermen, just like their Daddy.